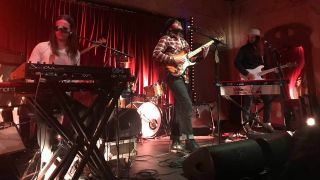 Dallas band The Texas Gentlemen pulled up at London’s Bush Hall last night after a short UK tour to promote their debut album TX Jelly. Classic Rock were there, eager to see if a 25-strong group of musicians who’ve modelled themselves on stellar session outfits like The Wrecking Crew or The Swampers could succeed onstage when reduced to a mere five-piece. Did we say ‘mere’? Suffice to say, we weren’t disappointed. Virtuosity comes in two forms. There’s the kind where speed in king: it’s about shining in the spotlight, where thousands of hours of furious practice lead to moments of technically vivid showboating. It’s impressive, but it looks like hard work. And then there’s the kind you get with a band like The Texas Gentlemen, where the playing appears to be utterly without effort, and individual brilliance is subsumed into the group dynamic. It’s all about the song rather than the solo. Watching the Texas Gentlemen is like watching The MGs or The Dap-Kings or even The Band. They’re masters at work, but it always feels like play. TX Jelly sometimes feels like a compilation album of bands of completely different styles. There’s the loose-limbed, Allman Brothers-style Southern Rock of Habbie Doobie. There’s the mournful Nashville country of Dream Along. And there’s Superstition, which sounds like the kind of crazed detour Brian Wilson might have taken had he spent a little longer in the sandpit and been joined in the dirt by Harry Nilsson (although you presume both would have balked at the line ‘Do you believe in ghosts? Do you believe they can give you blow jobs?’). Live, it’s the same. The band change styles effortlessly, throwing in jazz shapes or dropping into a greasy funk groove at the drop of a stetson. It’s almost miraculous. They look good. Real good. Long hair. Big hats. Aviator shades. A denim shirt with ‘Texas Gentlemen’ embroidered in gold on the back. A drummer with braids. These guys look like they’ve been helicoptered in from the VIP enclosure at Woodstock. And as they pass a bottle of whiskey around the stage and make up a song about it on the spot (Passin’ Whiskey, it seems to be called), it’s difficult to imagine anything much cooler. Are A Thousand Horses about to become the world's biggest Southern rock band? There’s a lovely version of Willie Nelson’s Crazy, a song so sweet it prompts two men near the front to waltz. There’s an utterly monstrous take on The Meters’ classic Cissy Strut. And, as the evening draws to a climax, we’re presented with a lascivious grind through Link Wray’s Rumble that eventually transforms into a cover of Johnny Kidd & The Pirates’ Shakin’ All Over and sounds like Iron Butterly at their most unhinged. It’s one of those shows. The Texas Gentlemen perform for an hour, it feels like 20 minutes, and Creedence pumps through the PA before there’s any thought of an encore. And as your ears ring and you ponder the brilliance of the set on your way home, you realise they didn’t even play your favourite tracks (Bondurant Woman and Subaru, since you ask). This was amazing. TX Jelly is out now.